Kundiman is reading with the Lunchtime Poems reading series on Tuesday, July 28, 12:30 - 1:30pm. Reading will be held on the Plaza in Military Park, Newark, NJ. Featured readers are Wo Chan, Chen Chen, Amy Meng, and Alison Roh Park. Wo Chan is a queer Fujianese poet and drag performer. A recipient of fellowships from Poets House, Kundiman, and Lambda Literary, Wo’s work has been published in cream city review, BARZAHK, and VYM Magazine. As a member of Brooklyn-based drag alliance, Switch n' Play, Wo has performed at venues including Brooklyn Pride, The Trevor Project, and the Architectural Digest Expo. Wo is a 2015 AAWW Margins Fellow. Amy Meng’s poetry has appeared or is forthcoming in Cream City Review, Indiana Review, The Literary Review, The Normal School, North Dakota Quarterly, Pleiades, and Slice Magazine. She is a Kundiman Fellow and was a finalist for the Margins fellowship. Currently, she teaches creative writing at Rutgers University and serves as a poetry editor at Bodega Magazine. Alison Roh Park is a Kundiman fellow, Pushcart nominated poet, and past winner of of the PSA New York Chapbook Fellowship, Poets & Writers Magazine Amy Award, and Jerome Foundation Travel and Study Grant. She teaches ethnic studies at Hunter College and is a founding member of The Good Times Collective of emerging poets writing in the tradition of Lucille Clifton. In case of rain, readings will be held in the New Jersey Historical Society as 52 Park Place. Co-sponsored by the Geraldine R. Dodge Poetry Festival and the Military Park Partnership. Admission is free. Jay Deshpande’s poems have appeared in Narrative, Sixth Finch, Atlas Review, Handsome, Forklift, Ohio and elsewhere. He is the author of Love the Stranger, forthcoming from YesYes Books in 2015. He has studied poetry at Columbia University and served as poetry editor of AGNI. He lives in Brooklyn. You can find him @jdeshpan and at jaydeshpande.com. Sandra Lim is the author of The Wilderness (W.W. Norton, 2014), selected by Louise Glück for the Barnard Women Poets Prize, and a previous collection of poetry, Loveliest Grotesque (Kore Press, 2006). A 2015 Pushcart Prize winner, she has received fellowships from the MacDowell Colony, the Vermont Studio Center, and the Getty Research Institute. Lim was born in Seoul, Korea and educated at Stanford University, UC Berkeley, and the Iowa Writers’ Workshop. She is an Assistant Professor of English at the University of Massachusetts, Lowell and lives in Cambridge, MA. Jee Leong Koh is the author of four books of poems, including Seven Studies for a Self Portrait (Bench Press). His latest collection The Pillow Book (Math Paper Press) has been translated into Japanese by Keisuke Tsubono, and published in an illustrated bilingual edition by Awai Books. It is shortlisted for the 2014 Singapore Literature Prize. Jee is the co-chair of the inaugural Singapore Literature Festival in NYC, and the curator of the arts website Singapore Poetry (http://singaporepoetry.com/). He has a new book of poems forthcoming from Carcanet Press (UK) in July 2015. Keisuke Tsubono is a translator, writer, editor, and scholar of American literature. He is also a co-founder of Awai Books, Ph.D student in contemporary literary studies at the University of Tokyo, and Fulbright visiting student researcher at New York University (2014-2015). Congrats, dear Wo! Visit here for more information about the 2014 Lambda Literary Fellows. Cathy Linh Che: Your book A Nuclear Family came out this spring. Congratulations! Could you talk a little about the book's title? 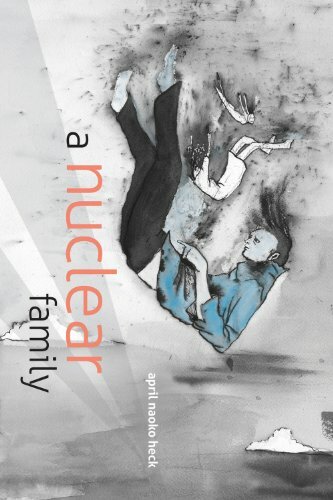 The title A Nuclear Family works on several levels: My Japanese great-grandmother was a survivor of Hiroshima, and on the day the bomb fell, my mother was in the womb about twenty miles away in Hiroshima prefecture. My mother later went on to marry my white, American father––who, ironically, worked for a nuclear power plant through the 1980s. During that time––during most of my childhood in Ohio––my little sister, our parents, and I made up a "nuclear family," in that utterly romantic sense of the term. Yes, “A Nutty Family”––that’s accurate too. Cathy: We attended all three Kundiman retreats together and graduated together. Why did you apply, and what have you found there as a fellow? At my first retreat, I cried as much as I laughed, often in the same breath. The retreat’s workshops were the first time I’d ever studied writing with Asian American faculty. And even though all of us poets came from different places, the common patterns in our histories and struggles to assimilate made for richer conversations and deeper sense of belonging than I’d ever experienced in an academic setting. Kundiman was super vitamin to my creative spirit. It was reinvigorated courage and motivation. It was detox, adrenaline, recovery. It was, and is, my poetry home. Cathy: What advice would you give to a poet who wants to publish a first book? Take your time, be patient, and aim high. Everyone should send poems to The New Yorker. Everyone should send their manuscript to the Yale Series of Younger Poets Prize. Over time your best poems will find the right homes, and your manuscript will find the right press. Don’t compare yourself to others. Just do your work with as much joy as you can muster, trust in the process, and, maybe above all, help your friends. The rewards of the latter continue to surprise and delight me. April Naoko Heck was born in Tokyo and moved to the U.S. with her family when she was seven. A Kundiman Fellow, she has been awarded residencies from the Virginia Center for the Creative Arts and Vermont Studio Center. A Nuclear Family, her first collection of poems, was released by UpSet Press in spring 2014 and is available on Amazon. Photo by Rachel Eliza Griffiths; book cover by Bianca Stone.